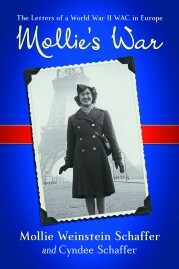 I will be the featured author discussing “Mollie’s War” at the next Chicago Jewish Authors Literary series at Max and Benny’s restaurant in Northbrook on Monday, April 23 at 7 PM. Please join us. It is free to the public. I was part of a panel discussion on Outspoken with Karon, a cable access TV show which airs in the Western suburbs. We discussed AAUW (American Association of University Women) and books written by members. Here is the link to the show.